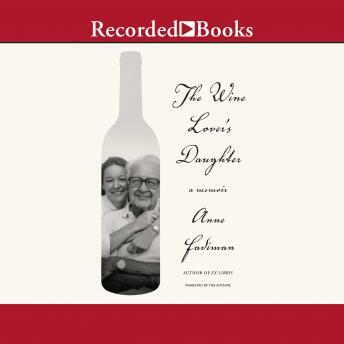 A new memoir by the celebrated essayist that explores her relationship with her father, a lover of wine In The Wine Lover's Daughter, Anne Fadiman examines-with all her characteristic wit and feeling-her relationship with her father, Clifton Fadiman, a renowned literary critic, editor, and radio host whose greatest love was wine. An appreciation of wine-along with a plummy upper-crust accent, expensive suits, and an encyclopedic knowledge of Western literature-was an essential element of Clifton Fadiman's escape from lower-middle-class Brooklyn to swanky Manhattan. But wine was not just a class-vaulting accessory; it was an object of ardent desire. The Wine Lover's Daughter traces the arc of a man's infatuation from the glass of cheap Graves he drank in Paris in 1927; through the Chateau Lafite-Rothschild 1904 he drank to celebrate his eightieth birthday, when he and the bottle were exactly the same age; to the wines that sustained him in his last years, when he was blind but still buoyed, as always, by hedonism. Wine is the spine of this touching memoir; the life and character of Fadiman's father, along with her relationship with him and her own less ardent relationship with wine, are the flesh. The Wine Lover's Daughter is a poignant exploration of love, ambition, class, family, and the pleasures of the palate by one of our finest essayists.